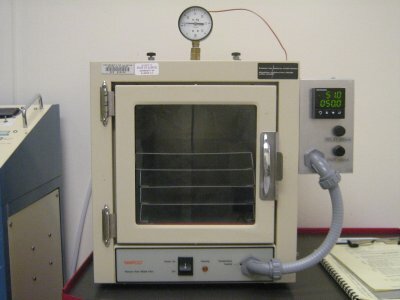 The vacuum oven has a maximum operating temperature of 200°C. Only manual processes can be run by setting the temperature, calculating the time until the desired temperature is reached using a heating in vacuum curve, waiting the desired time, and then manually setting the temperature back to the idling temperature of 50°C. The interior dimensions of the oven are 7.5" x 7.5".